I've been putting this post off for quite a while now but only because I wanted everything finished and as spot on as I could possibly manage before the post was put together. But when it comes to room decor and my seemingly new hobby/passion/obsession with getting my home just how I want it, then time and putting things on the back burner if required is something I am more than willing to do. ...and we all know that this isn't likely to happen so I must face facts, when it's just myself and my somewhat DIY reluctant Husband (oh and my Father-in-Law helped with the papering too) getting everything done then I know I'm going to need to have patience. 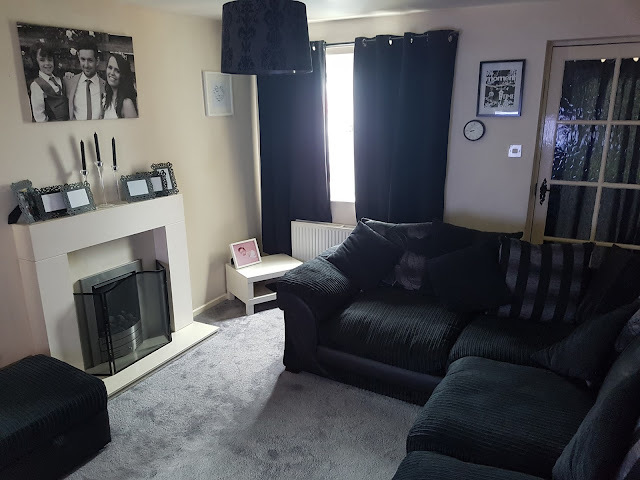 But it has all paid off now and I love my new living room - but why did I start it? Well you may have spotted a little while ago that I began a living room upgrade collaboration with Inspired Wallpaper and it was actually the amazing design of their paper which ignited this dormant little home improvement bug that I seemingly had snoozing inside of me. The wallpaper they sent me was lovely - really warming and brightening, whilst still remaining understated and quite classy - and the minute it was on my wall I knew everything else in that room had to change to match up to it's fabulousness. 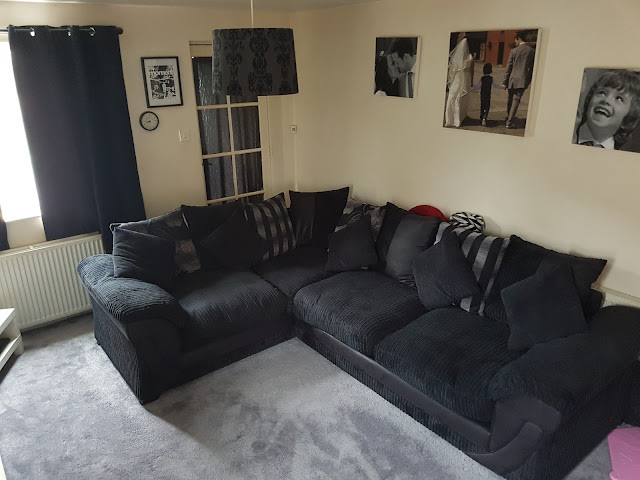 At the time my living room was black and grey and whilst it was OK, it was starting to feel drab, way too small, too cluttered and was really quite dark, and I suppose a little dingy looking too if I'm honest. I wanted a change, something fresher, more welcoming and my choice of a light yellow, statement making wallpaper certainly helped with this. Once the paper was decided upon I knew whatever else I did with the room would have to tie in with the grey carpet (there unfortunately weren't enough pennies in the pot to change that too - although it is on the horizon) but I wanted to add something a little different and that is where the copper accessories played their part. I collected things from charity shops, from shop sales and even bargain selling sites and then up-cycled and spray painted everything copper to match the other room accessories. 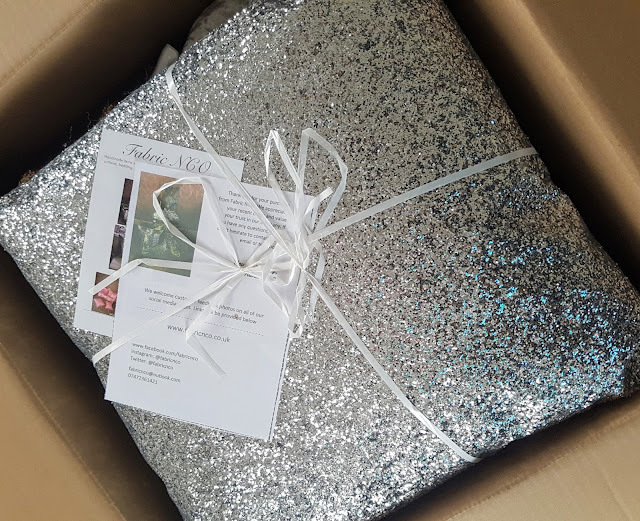 ...they are huge, are really well made, are brilliant quality and just check out that sparkle - fabulous. The amazing owner even custom made me three mega sparkly copper coloured cushions to help add a little more coordinating detail to the room too. Next, by investing, not too many pounds at all actually, into the every-parent-needs-one Ikea storage unit we now have under the TV, all of Willow's toys and books can be stored away, hidden from view and kept tidy which really helps keep the room looking uncluttered - perfect for a small house (and for my need to have things just so when I'm relaxing on an evening). I copper spray painted black curtain poles, glass candle stick holders, glass vases, even the black fire guard cover just to make everything match and tie in with each other. 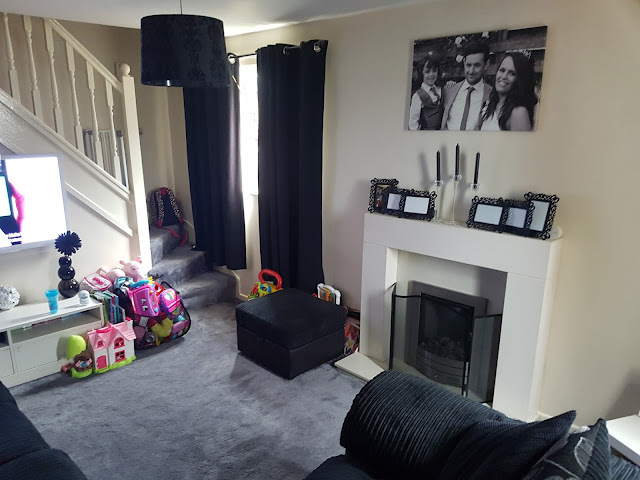 I feel so much happier spending time in the house now than I did before and (on the very rare off chance that this ever happens) if people do pop in to visit us, I'm no longer embarrassed at all by the way my living room looks.